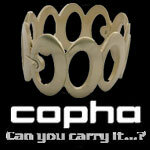 Copha Copha is a Danish brand, and is active in the market since 2004. The bracelets are designed by Rolf Eriksen. He was born in Copenhagen and was a member of the Danish National Freestyle Ski Team mogul skier and champion before he started designing watches and jewelry. His ideas and designs are found in the global street culture and fashion combined it with the Scandinavian coolness and simplicity. This results in a beautiful watch brand that goes along with the time and fashion. The watches are distinguished by their simple but beautiful forms.